To continue this week's coverage about Queens' culinary treasures outside of Astoria and LIC, I wanted to tell you about a fun cooking demo Dan and I attended this week at eXo Bistro in Whitestone. I've skimmed the surface with these classes a few weeks ago, but wanted to shed light on exactly how they work and hopefully to pique your interest about taking them. I can honestly say that not only did I learn a lot, I ate well, had fun and met cool people. Taking place every Monday from 6 p.m. to 8 p.m. in eXo's main dining room, the demo classes are led by Chef, Constantine Kalandranis, also referred by many as Costa. But it's not just the chef as you may know that makes the experience, it's the full team on staff. eXo is a great example of truly harmonious culinary teamwork that's so closely in sync, they run like a well oiled machine. We sat in the front/middle part of the restaurant that was organized slightly different than usual for the purpose of the class. Dan and I had a prime spot for observing all the action at the demo station, as we sat in the elevated dining area at a long rectangular table with other guests. The class started out with a warm welcome from eXo's team, and then Costa got into the nitty gritty details about the food we were about to eat. I liked his vivid descriptions and thorough demonstrations as they related to all dishes, but especially about homemade pita bread. It's something I wouldn't think to make on my own and usually rely on a good grocery store to supply me with. But the technique seemed pretty user friendly and enjoyable that it certainly whet my appetite to try it at home. Here's a short video of Costa explaining the pita making process, showing that you don't need any fancy equipment to make this dish on your own. 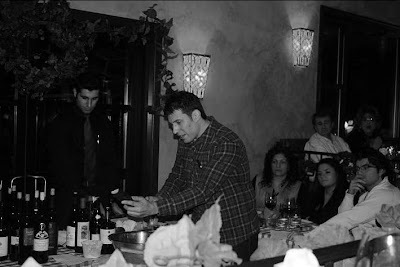 Aside from all the eating and the instruction, we also received thoughtful Greek wine pairings provided by a local wine expert, Spiros from Fantis wine. We enjoyed trying different regional Greek wines and I was especially loving the whites, which I think Greek varieties are known for. After each course was properly demonstrated, we were served a generous portion of it to enjoy and chat about with our dining companions. I liked the interaction eXo's team had with their clientele during food service and people (including me) seemed to enjoy chatting with the experts about what was on their plate. Homemade Pita and Tzatziki - Although these two items seem like the simplest, most basic staples in Greek cuisine, most people don't attempt to make them at home. I have to admit that I've tried tzatziki before, but wasn't completely happy with the outcome. After having eXo's version and watching it come together before my eyes, I was more confident that I can improve mine next time around. Not only was eXo's tzatziki wonderfully refreshing, its use of good quality ingredients showed just how important this is in constructing a classic dish. In terms of the pita, I was surprised to see that it was pan fried, not always grilled as I assumed. 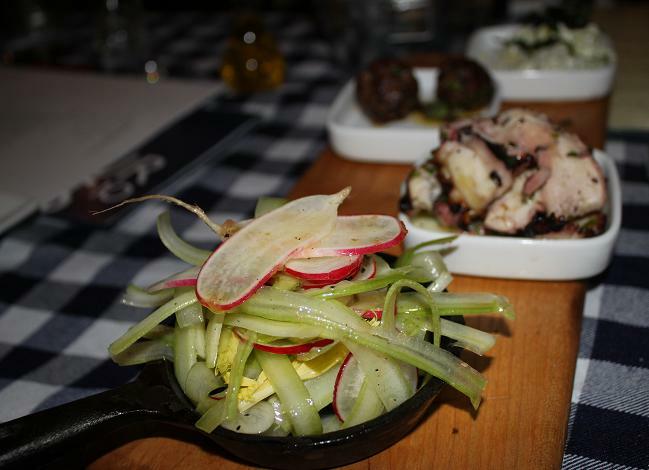 It was an amazing feeling to bite into a soft, salty pita slice and to pair it with eXo's delicious meze such as the char-grilled octopus, lamb meatballs and a most refreshing, zesty radish/celery salad that I absolutely want to recreate at home. 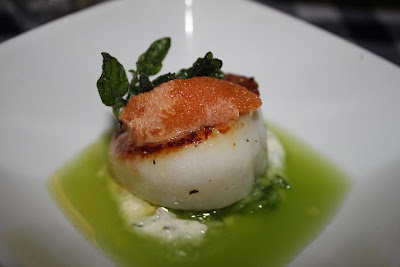 Seared Diver Scallops - Learning about different scallop varieties captured my attention, and I was further intrigued to learn how to achieve that perfect exterior sear you find in restaurant scallops. The key, as we found out was to make sure the scallop was dry - easier said than done for sure, but part of the process is also knowing how to choose your scallops. The scallop dish we tried served as a wonderful transition between courses, as it included cucumber jus (also made into a champagne cocktail and served alongside this dish), Greek yogurt and some pickled garlic. Its overall flavor was very clean and mild, no doubt influenced by the cucumber, while the texture was superb - tender on the inside but nicely charred and slightly crispy on the outside. 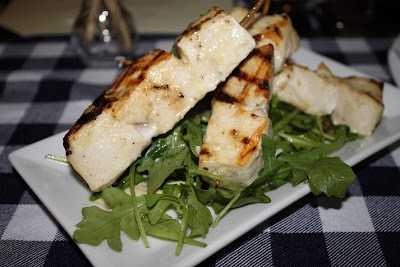 Swordfish Souvlaki - While some of our dining companions expressed concerns about swordfish, I was pretty excited. Having made swordfish at home with decent results, I was motivated by the prospect of further improving it in my own kitchen. What we learned in the class was that it's really about the quality of fish (swordfish is seasonal) as well as the marinade you use. Soaked in a simple latholemono (lemon vinaigrette), the swordfish was amazingly tender, juicy and really hearty too. I can see why it's sometimes referred to as a steak fish. Loukaniko Sausage Fricasee - Next came an explanation about good quality Greek sausage called loukaniko. While eXo doesn't make their own, they make sure to purchase it from a quality supplier, which happens to be located in the neighborhood. I liked that this dish was an example of a one-pot-wonder, being cooked in one pan, with potatoes, herbs and spices. Additionally incorporating a green element in the form of braised kale, it was a prime example of a simple and flavorful ethnic comfort food. 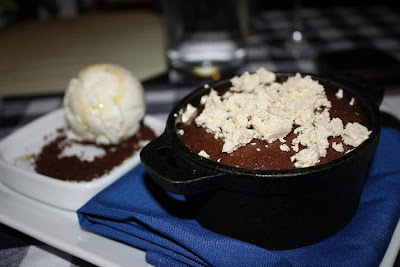 Warm Chocolate Cake - While dessert wasn't demo'd, we indulged to our heart's delight in a soft, warm fudgy cake that was the definition of decadence. Elevated in flavor by interesting ingredients such as halvah and cinnamon, it wasn't your traditional molten lava cake, rather like everything else at eXo, they really made it their own. If you're curious about taking a class at eXo, here's more information. Talk to any of their friendly staff, and I'm sure you'll become as hooked as me.